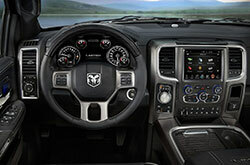 What's New in the RAM 1500? 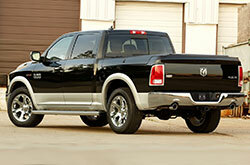 With its enduring design and impressive durability, the RAM 1500 continues to be a top choice among Scottsdale drivers. Whether you need a trusty work truck or a luxurious personal ride, you'll find that the RAM 1500 serves excellent features, performance and practicality. The 2017 RAM 1500 in Scottsdale arrives with a slimmed down list of trims and updated standard features for each of its levels, making choosing your next truck even easier. Additionally, the transmission has shifted in every model from a standard six-speed automatic to a highly advanced eight-speed automatic. The RAM 1500 is available in several body types and trims. 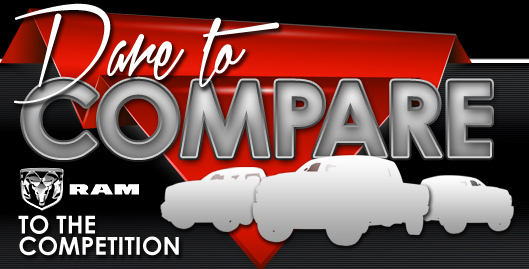 Buyers have the choice of a two-door regular cab, a four-door quad cab and a more spacious four-door crew cab. On top of that, buyers have a selection of ten trim levels: Tradesman, Express, HFE, SLT, Big Horn/Lone Star, Sport, Rebel, Laramie, Laramie Longhorn and Limited. If you are looking for a no-frills work truck, 2017 RAM 1500 reviews say you can't go wrong witht the Tradesman. Standard features on this trim include a six-speaker sound system with USB and auxiliary ports, a Class IV receiver hitch, a seven pin wiring harness, spray-in bedliner and a locking tailgate. The Express is very similar but with a few different exterior and interior features, including the deletion of the receiver hitch and the addition of carpeted floors and floormats. The HFE, or high fuel economy trim, is offered with standard rear wheel drive and an optional diesel V6 engine. This trim also comes standard with automatic engine stop-start and heated mirrors. Moving on up to the SLT, this trim starts to add more comfort and convenience features like a 5-in. touchscreen display with satellite radio, Bluetooth connectivity, chrome trim and power accessories. At the next level is the Big Horn/Lone Star trim, which comes with upgraded upholstery, remote start, a rearview camera and an upgraded display and infotainment system. Power is upgraded at the Sport trim, which adds a V8 engine as well as a driver information display, power-adjustable pedals and LED taillights. 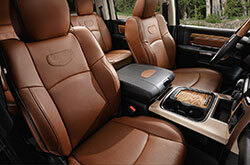 The Laramie features chrome-accented wheels, leather upholstery, wood trim and a 10-speaker surround sound system. The next trim, the Laramie Longhorn is similar, offering a model-exclusive exterior styling clues as well as a larger fuel tank and a navigation system. The top-of-the-line Limited model's features include premium leather upholstery, side step bars and a self-leveling air suspension. Finally, the last trim choice is the RAM 1500 Rebel, which is off-road focused and comes standard with black fender flares, LED foglights, tow hooks, all-terrain tires, and front and rear Bilstein shock absorbers. To learn even more about the trims and available features, please stop by and talk to one of our knowledgeable salespeople! Regardless of model choice, the 2017 RAM 1500 in Scottsdale boasts plenty of power and capability. The eight-speed automatic is standard as is rear-wheel drive; the six-speed automatic and four-wheel drive are available. The 1500 can also tow an average of 8,500 pounds, although the exact number differs based on which engine your RAM truck equipped with. 2017 RAM 1500 reviews recommend either the diesel V6 or the gas-powered V8 for the most tow muscle. 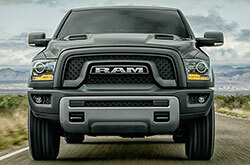 Standard, the RAM 1500 comes with a 3.6-liter V6 that produces 305 horsepower and 269 lb.-ft. This configuration has a fuel economy of 20 MPG combined (eight-speed transmission; 4x2). On select higher level trims, a 5.7-liter V8 engine that generates 395 hp and 410 lb-ft of torque comes standard. This engine achieves 17 miles to the gallon combined (eight-speed transmission; 4x2). A turbocharged 3.0-liter diesel V6 engine is also available on several trims. The diesel rates in at 240 hp and 420 lb-ft of torque. Standard safety features on the RAM 1500 include antilock disc brakes, stability control, trailer sway control and a comprehensive airbag system. Rearview cameras and rear parking sensors are available as additional features, and come standard on some trims. Uconnect Access emergency telematics are also available, and can put you in contact with 911 operators at the touch of a button in the event of an emergency. 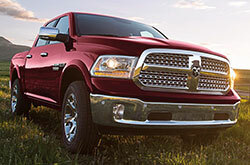 The RAM 1500 also scored well in government and IIHS safety tests.